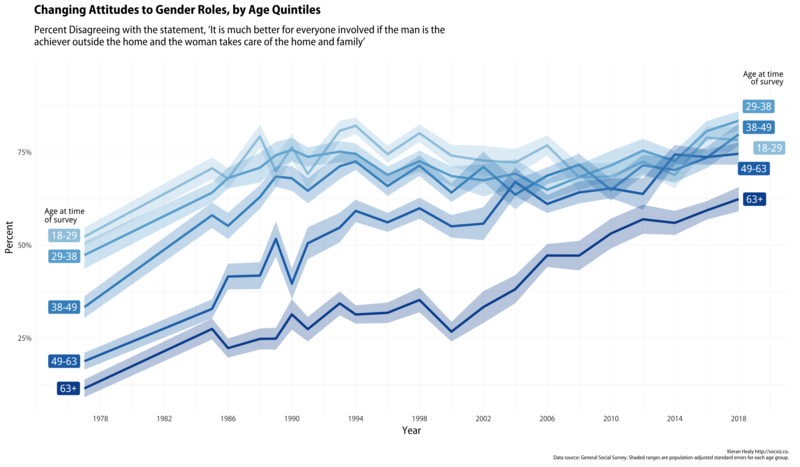 The data from the 2018 wave of the General Social Survey was released during the week, leading to a flurry of graphs showing various trends. The GSS is one of the most important sources of information on various aspects of U.S. society. One of the best things about it is that the data is freely available for more than forty years worth of surveys. Here I’ll walk through my own quick look at the data, in order to show how R can tidily manage data from a complex survey. It is much better for everyone involved if the man is the achiever outside the home and the woman takes care of the home and family. Respondents may answer that they Strongly Agree, Agree, Disagree, or Strongly Disagree with the statement (as well as refusing to answer, or saying they don’t know). We’ll grab the GSS Cumulative Data File in Stata’s .dta format, and work from there in R, using the Tidyverse tools, Thomas Lumley’s Survey package, and Greg Freedman Ellis’s srvyr package, which provides a set of wrappers to survey functions that allow them to be piped and worked with in a way familiar to tidyverse residents. We also load some libraries that aren’t strictly needed, but that will make our plots conform to the house style. This is a quick-and-dirty function we’ll use to clean some age group labels we’ll create in a minute. The names of some of the weighting and stratifying variables. Load in the data to gss_all and create a small subset of it, gss_sm containing just the variables of interest. The read_stata() function has carried over the labeling information from Stata, which might be useful to us under other circumstances. Columns with, e.g., <dbl+lbl> designations behave like regular <dbl> (double-precision floating point numbers), but have the label information as metadata. Now we clean up gss_sm a bit, discarding some of the label and missing value information we don’t need. We also create some new variables: age quintiles, a variable flagging whether a respondent is 25 or younger, recoded fefam to binary “Agree” or “Disagree” (with non-responses dropped). We’re in a position to draw some pictures of fefam trends now. Let’s take a closer look at the age breakdown. ## Warning: Removed 100 rows containing missing values (geom_label_repel). Finally, we can make a plot to get a sense of generational replacement and cohort effects. We’ll make two panels. 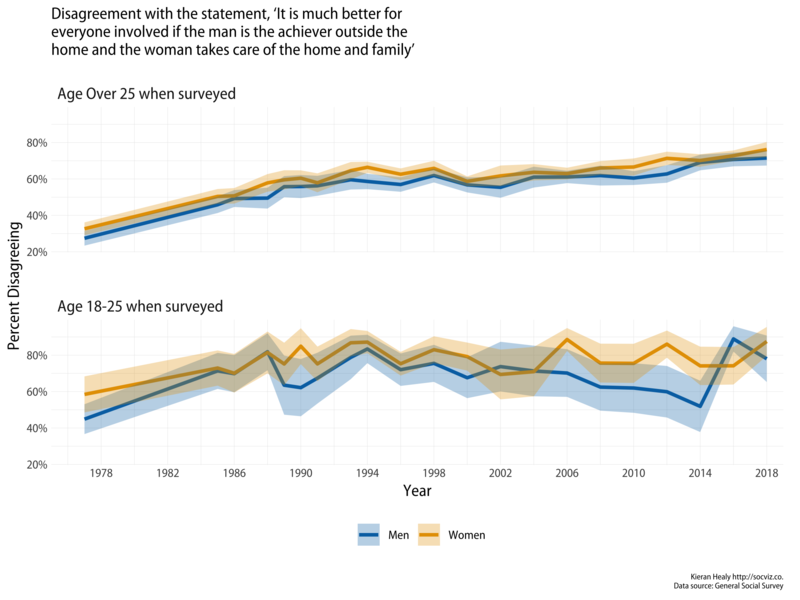 First, a comparison of more or less the same cohort (though not of course the same individuals): these are people who answered the fefam question in 1977 when they were aged 18-25 and those who answered in 2018 and were aged 63 or older. 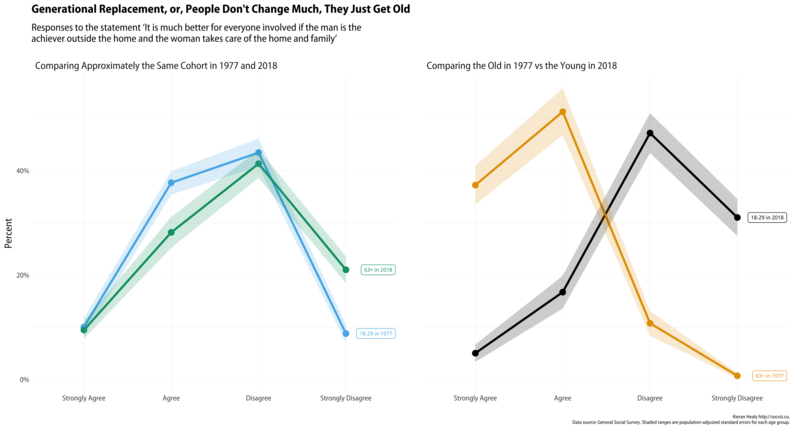 We’ll also look at two very different cohorts: people who were over 63 in 1977, and people who were aged 18-25 in 2018. ## Warning: Removed 12 rows containing missing values (geom_label_repel).